Grant retired as the eighth most winning coach in NFL history with an overall record of 161 wins, 99 losses, and 5 ties. During his tenure with the Vikings, he led the Vikings to four Super Bowls, eleven division titles, one NFL Championship, and three Conference Championships. Harry Peter "Bud" Grant, Jr (born May 20, 1927) is the longtime former American football head coach of the Minnesota Vikings of the National Football League (NFL) for eighteen seasons. Grant was the second (1967–83) and fourth (1985) head coach of the team. In addition to coaching the Vikings, he was the head coach of the Winnipeg Blue Bombers of the Canadian Football League (CFL) for ten seasons. Along with being the winningest coach in Vikings history, Grant is third winningest professional football coach, behind Don Shula and George Halas, with a combined 290 wins in the NFL and CFL. Grant was elected to the Canadian Football Hall of Fame in 1983 and into the Pro Football Hall of Fame in 1994. Grant attended the University of Minnesota and was a three sport athlete in football, basketball, and baseball. Following college, he had a professional playing career for the Minneapolis Lakers of the National Basketball Association (NBA), Philadelphia Eagles of the NFL, and Winnipeg Blue Bombers of the CFL. Bud Grant was born on May 20, 1927 in Superior, Wisconsin to Harry Peter Sr. and Bernice Grant. His mother called him "Buddy Boy", which later became "Bud". As a child, Grant was diagnosed with poliomyelitis and a doctor suggested becoming active in sports to strengthen his weakened leg muscles over time. He started with baseball then added basketball and football as he got older. Due to a lack of organized school teams, he arranged to have football games between neighborhoods and contacted kids from other schools to participate. During the weekends, he would spend time outdoors alone hunting rabbits. In his late teens and college years, he played organized baseball in Minnesota and Wisconsin. Bud married Pat in 1950, and they have five children. Bud's son, Mike Grant, has been the football head coach for Eden Prairie High School in Eden Prairie, Minnesota since 1992. Mike Grant has coached Eden Prairie to six state championships in twelve years. Bud Grant's grandson, Ryan Grant, was a quarterback, and linebacker at Eden Prairie and now he plays at the University of Minnesota as a linebacker. Grant played football, basketball, and baseball at Superior High School. He graduated from high school in 1945 and enlisted in the Navy during World War II. He was assigned to the Great Lakes Naval Training Station in Illinois and played on the football team coached by Paul Brown. Using an acceptance letter from the University of Wisconsin-Madison to be discharged from the service, Grant decided to attend the University of Minnesota instead. He was a three sport, nine letterman athlete in football, basketball, and baseball for the Minnesota Golden Gophers, earning All-Big Ten honors in football twice. After leaving the University of Minnesota, Grant was selected in both the NFL and NBA Draft. He was selected in the first round (fourteenth overall) of the 1950 NFL Draft by the Philadelphia Eagles and fourth round (forty-second overall) selection of the Minneapolis Lakers in the 1950 NBA Draft. He played thirty-five games during the 1949-50 NBA season and signed with the Lakers for a second season, the 1950-51 NBA season. He chose to continue his basketball career and play for the Lakers because they were local and because he was offered a raise to stay for the season. Grant's friend, Sid Hartman, was the Lakers' general manager, which may have influenced his decision to remain with the team. He averaged 2.6 points per game in his two seasons as a reserve with the Lakers and was a member of the 1950 championship team. Grant's contact expired at the end of the 1952 NFL season and the Eagles refused to pay him what he thought he was worth. The Winnipeg Blue Bombers of the CFL had been interested in Grant while in college. Grant left for Winnipeg, Canada in 1953 and became the first professional player to "play out his option" and leave for another team. He played for the Blue Bombers until 1956 as an offensive end and was named a Western Conference all-star three times. He led the Western Conference in pass receptions for the 1953, 1954, and 1956 seasons and receiving yards for the 1953 and 1956 seasons. He also holds the distinction of having five interceptions in a playoff game, played on October 28, 1953, which is a CFL record. The Blue Bombers played for the Grey Cup in 1953, but lost to the Hamilton Tiger-Cats in the 41st Grey Cup game. Blue Bombers management decided that they needed a new coach prior to the 1957 season. On January 30, 1956, Grant accepted the Blue Bombers head coaching position after impressing management with his ability to make adjustments on offense and defense as a player. Club president, J.T. Russell, thought that Grant could coach even though nobody else did. Grant would remain the head coach of the Blue Bombers until 1966. During his ten seasons as head coach in Winnipeg, he led the team to six Grey Cup appearances, winning the championship four times in 1958, 1959, 1961, and 1962. He finished his Blue Bombers coaching career with a regular season record of 105 wins, 53 loses, and two ties and an overall record of 122 wins, 66 loses, and 3 ties. Grant was the CFL Coach of the Year in 1965. Grant took on additional responsibilities as a club manager between 1964 and 1966. Max Winter, the Minnesota Vikings founder, contacted Grant in 1961 and asked him to coach the new NFL expansion team. Grant declined the offer and remained in Winnipeg until 1967 when Winter and General Manager Jim Finks were successful in luring Grant to Minnesota. Grant continued his coaching success in the NFL as he took over from original coach, Norm Van Brocklin. Over his tenure as Vikings head coach, Grant was known for instilling discipline in his teams and displaying a lack of emotion during games. He believed that football is a game of controlled emotion and teams wouldn't follow the coach's lead if he were to panic or lose his poise during the course of a game. He required his team to stand at attention in a straight line during the entire national anthem played before the game and even had national anthem practice. Grant required outdoor practice during the winter to get players used to the cold weather and would not allow heaters on the sidelines during games. After coaching football, Grant became a less prominent public figure and focused his time on hunting and fishing and supporting environmental reforms. He has been a spokesperson opposing Native American hunting and fishing treaty rights in Minnesota. In 1993, Grant's efforts resulted in a death threat. In 2005, he spoke at a Capitol rally in Minnesota for the conservation of wetlands, wetland wildlife, and water. Grant addressed the five thousand supporters saying, "In this [legislative] session, we want to see some action. It's more important than any stadium they could ever build in this state." He continues to maintain his connections with the Vikings as a consultant for the team and maintains an office at the team's headquarters in Eden Prairie. 1. ^ a b c "Grant's legacy still looms in Minnesota". Associated Press (2006-08-12). Retrieved on 2007-05-25. 2. ^ a b "Beating the Clock". American Football Monthly (June 1999). Retrieved on 2007-05-13. 3. ^ a b "Harry (Bud) Grant". Canadian Football Hall of Fame & Museum. Retrieved on 2007-05-13. 4. ^ a b c "Bud Grant". Pro Football Hall of Fame. Retrieved on 2007-05-13. 5. ^ a b c d e f g h i j k l m n o p q r s t u "History: Bud Grant". Viking Update (2001-07-19). Retrieved on 2007-05-12. 6. ^ a b c Kumpula, Carlo (2007-05-09). "'The Glacier' and 'The Gladiator'". Spooner Advocate (Spooner, Wisconsin). Retrieved on 2007-05-13. 7. ^ a b c d e f g h i j k l m n o p q r s "Bud Grant". Manlyweb.com. Retrieved on 2007-05-13. 8. ^ Brackin, Dennis; Rand, Mike. "Success has a price". Star Tribune. Retrieved on 2007-05-07. 9. ^ Rand, Michael (2007-11-23). "Eagles' all-around game proves to be too much". Retrieved on 24 November 2007. 10. ^ Monter, Chris (2007-04-05). "Ryan Grant Commits to Minnesota". GoldenSports.net. Retrieved on 2007-05-13. 11. ^ a b c d Marshall, Brian (1998). "BUD GRANT: PURPLE AND BLUE, THROUGH AND THROUGH". Professional Football Researchers Association. Retrieved on 2007-05-13. 12. ^ "The 1950 NFL Draft". Pro Football Hall of Fame. Retrieved on 2007-05-13. 13. ^ "1950 NBA Draft". Basketball-Reference.com. Retrieved on 2007-05-13. 14. ^ "Bud Grant Statistics". Basketball-Reference.com. Retrieved on 2007-05-28. 15. ^ "1950 Minneapolis Lakers". Basketball-Reference.com. Retrieved on 2007-05-13. 16. 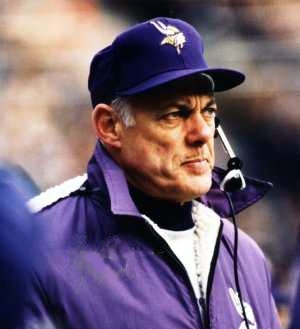 ^ "Bud Grant". Pro-Football-Reference.com. Retrieved on 2007-05-13. 17. ^ a b c d "Bud Grant". The Manitoba Sports Hall of Fame & Museum. Retrieved on 2007-05-13. 18. ^ "All-Time Playoff Records". CFL.ca. Retrieved on 2007-05-13. 19. ^ a b "HARRY PETER BUD GRANT". CFL.ca. Retrieved on 2007-05-13. 20. ^ "Grant Receives A Death Threat". The New York Times (1993-01-10). Retrieved on 2007-05-12. 21. ^ Anderson, Dennis (2005-01-11). "Rally hats on". Minnesota Environmental Partnership. Retrieved on 2007-05-25. 22. ^ Schultz, Chris (2005-04-11). "Open water has returned once again". Herald Journal. Retrieved on 2007-05-25.